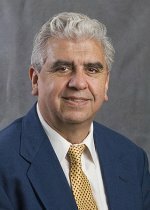 Congratulations to Dr. César Izaurralde, recently named Fellow of the Soil Science Society of America. This is the highest honor bestowed by the society, which is dedicated to the conservation and wise use of natural resources to produce crops while maintaining and improving the environment. For his outstanding achievements in leadership, professional service and research, Izaurralde was honored with the fellowship award at the society's annual meeting in November 2007 in New Orleans, Louisiana. Izaurralde's research at the Joint Global Change Research Institute, a collaboration of PNNL and the University of Maryland, focuses on 1) sustainable agriculture, 2) climate change impacts and adaptation in relation to agriculture and water resources and 3) climate change mitigation through soil carbon sequestration and reductions in soil emissions of nitrous oxide.